Largest proportion of open area available - up to 86% - which improves efficiency in cooling, coating, draining, heating and drying applications. Smallest diameter end rolls and drive rolls - mean that even your most delicate products are handled gently and easily with extremely tight transfers. No-slip, positive drive - eliminates the need for complicated tracking mechanisms. 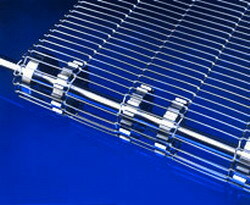 Stainless steel wire mesh belts easier to clean and maintain. Very low belt mass - means reduced power consumption for lower operating costs... plus less heat absorption during processing and easier handling. Variety of mesh sizes available - choose the exact degree of openness that provides both excellent strength and minimal contact between product and belt. Sometimes the process has to turn a corner.Wire mesh conveyor belt offer a space-saving solution and can be implemented immediately as a complete system that is hygienic and saves space, with an open or closed table top. The drive with a directly drive axle and integrated frequency control can be installed inside or outside the radius. 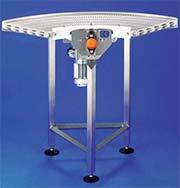 Conveyor curves are available in different sizes, all adjustable for height. Connecting tube are used for repairs and splicing applications. These are available for most diameter wires used in wire mesh belts. Call Technical Services if you have any questions concerning the appropriateness of using splicing tubes in your application. Light simple and cleaned easy to drive with these sprockets. Copyright © IST Technology Co., Ltd.